I’ll be honest, I’m an injury prone rider. Aches, sprains, and strains are a pretty common occurrence, and as I get older they just get worse. I wasn’t blessed with good joints, and let’s face it, regardless of your fitness level, riding is a tough sport on the body. Regardless of whether or not you take the occasional nose dive into the dirt, riding at any level or discipline is a full body exercise. Last year my coach recommended I try a product called Back on Track. She uses it on all of her horses, as well as herself, and recommended it as a great way to relieve muscle soreness. I’d honestly never heard of the product, but I figured, what’s the harm in trying, and bought myself a shirt. I haven’t looked back since. Made by Welltex, Back on Track® is a range of items marketed to horses, riders, and dogs, which offers natural pain relief. Back on Track products are built to reduce inflammation, enhance performance, and help to prevent injury. Each fibre of the fabric is infused with ceramic particles, which work to reflect the body’s natural heat as long wave infrared rays. The science is simple, heat increases blood circulation and blood circulation in the tissue relieves tension in the muscles. This leads to decreased inflammation, less stress on the muscle tissue, and less pain. The body naturally produces more heat during activity than when at rest, so the product is typically more effective when worn during exercise. On paper it does sound a bit too good to be true, and while I’ll attest that this product may not be for everybody, or work as good for some as others; I’ve seen a great amount of success with it. The Back on Track range of products is pretty wide for all their target audience(s). 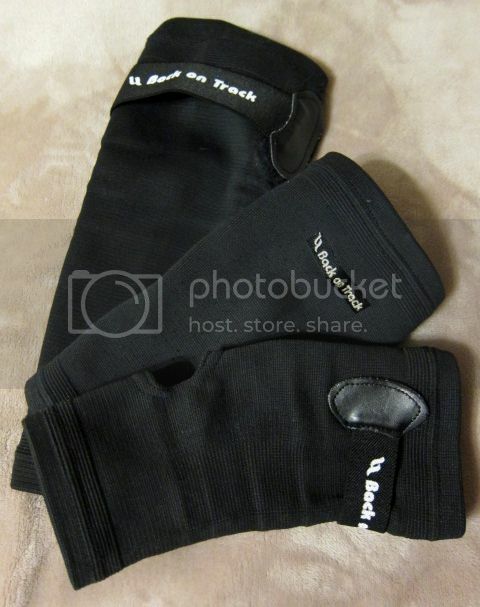 For humans there is everything from support braces for joints, various shirt styles, gloves, socks, blankets and more. For horses and dogs there are blankets, boots, wraps, etc.. There’s basically a product for your every need, or better yet, your every ache. Prices vary by products, with horse blankets and clothing items (shirts, sweaters) being more expensive than smaller braces and wraps. Back on Track products are not cost prohibitive, but if you start a collection (like I have) it can get to be a bit expensive. sometimes daily) basis. The support braces are thick enough to allow the product to also double as a support brace, but aren’t as bulky as some braces. This is a huge plus for me. I do have a prescription knee brace, and wear it less than my Back on Track knee brace simply because it is so bulky and thick. I can slip my Back on Track knee brace under my dress pants when I wear it to my day job, or fit it under my breeches at the barn without being uncomfortable. For those with general aches it is definitely something I’d recommend to help minimize the need for pain killers. I find it’s a great way to help with the occasional ache, especially on those damp and cold days. It’s also a great way, I’ve found, to minimize muscle strain after hard exercise. The same is true for horses. My barn uses Back on Track pretty frequently, their blankets are not only a great way to keep horses warm, but a good way to reduce inflammation and increase circulation after exercise or injury. It’s a product that was initially recommended to me, and one that I’ve happily recommended to equine and non-equine friends and colleagues alike.